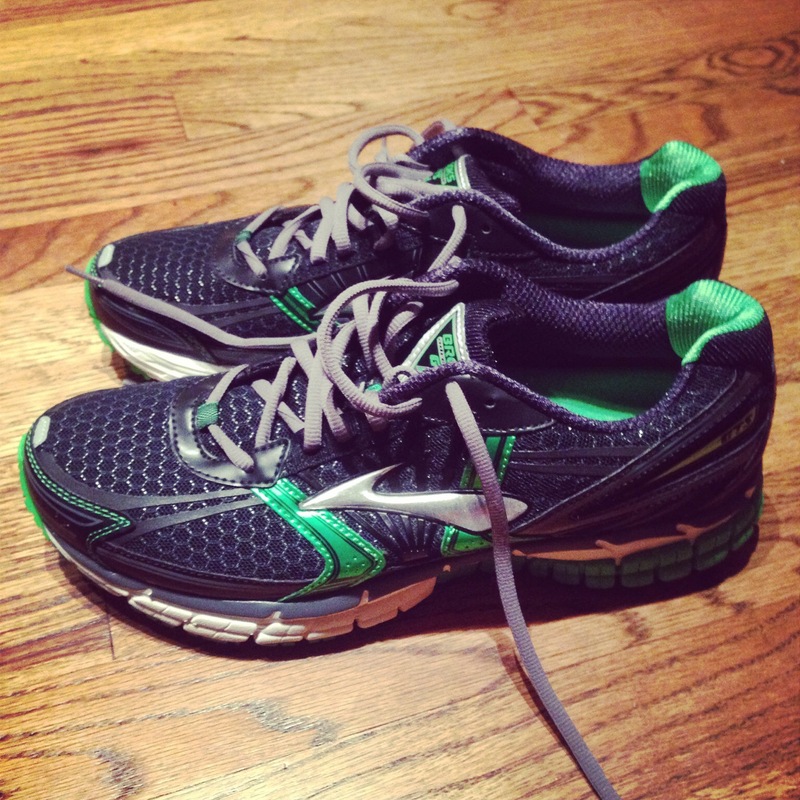 I’ve been running in the same make/model shoe for over 14 years – The Brooks Adrenaline GTS – and Friday was the first time I ever bought them in a color combination that differed from the standard blue/white/silver. Saturday’s run in these shoes was special but not for the reason I said above. The run was special because I was running with my daughter who recently “officially” became a runner. How did she “officially” become’ a runner? Before I get to that, here’s some history. My daughter is 13 years old and admittedly the memories of her time as a baby are a little fuzzy but it seems to me that she ran before she walked. Once she figured out how to move around on two legs versus all fours she ran everywhere. And it wasn’t the gangly toddler type of running. She ran with almost perfect form! Being a father who loves sports, the visions of soccer or lacrosse college scholarships ran through my head so we didn’t wait too long before signing her up for sports. During soccer and lacrosse practices it was very apparent that my daughter was the fastest kid on the field. During drills involving pure running she’d always finish first. Even when she was in a U6 co-ed soccer league she was faster than the boys. Parents always must restrain their adoration of their child because we are biased but on the field of competition the kid’s true talent will either be apparent or reality will smack the parents in the face. But alas team sports were not her thing. My daughter’s athletic skills during practice didn’t translate to the white hot pressure cooker of game day. She didn’t like the attention afforded her when she’d break from the pack and I’d see her slowing up to allow others to catch her so she wouldn’t be the object of everyone’s attention. My daughter’s compassion level is off the charts but her aggressiveness is in the negative territory and she was more interested in making sure everyone on the field had a good time than beating another kid for the ball. This was frustrating. When I said my daughter ran everywhere I am not exaggerating. She ran to the kitchen. She ran to the bedroom. She ran in the parking lot. She ran in church. It was hard for me to come to terms with the disconnect that I had to yell at her all the time to stop running in public places but when she got on the field of competition she would just prance around the action. After 2 seasons of soccer and 2 seasons of lacrosse my wife and I came to the conclusion that team sports weren’t our daughter’s thing and we should just get over it! When she entered 8th grade we encouraged her to join the running club and every Monday, Tuesday and Thursday after school the club stays after school to engage in cross country type running drills. It’s not a true cross country team but the program is meant to get kids acclimated to that type of training prior to high school. After a month or so of steady progression my daughter had a breakthrough last week when the coach challenged the kids to run a mile without stopping and my daughter was one of the few who were able to do that. She was so excited to tell me about this milestone that she informed me that she wanted to run a marathon! She and I had a long talk about the stress of training for a marathon and how that probably isn’t good for her 13 year old body right now but we can start running 5K’s together and see how that goes and then take up the mileage as she matures. That was the first time when it hit me that she may actually become one of those weird “runner” creatures like her dad. A couple of days later my daughter said that she hasn’t been able to run much this week and she wanted to run on Friday after school – Alone, by herself, on the streets of our neighborhood – and sure enough, she ran a short out-and-back 1.2 miles Friday on her own. That was it! That was the exact moment my daughter “officially” became a runner. She missed running so much that she wanted to do it on her own time. She could’ve spent that time on her iPad or watching her mindless Disney shows but she decided to lace up her shoes and head out the door for a run. That is what separates people who run because they HAVE to (in PE, because their parents force them or because a coach tells you to) from people who run because they WANT to. Runners do it for the joy. Runners do it because they like the way they feel during and after a nice run. Runners miss the days they can’t run. That run with my daughter was what made my Saturday run so special. It had nothing to do with the shoes but with the person who was running at my side. I’ve been a runner for over 15 years and I have tons of race t-shirts, finisher medals and bibs lining my drawers in the closet to prove it. I have completed a marathon, organized local races and served in leadership capacities with a local running club so I’ve experienced many highs from this great lifestyle but nothing compared to the day I got the privilege of running with my daughter who recently, like her dad did 15 years ago, decided to become a runner. During the past 13 years my daughter has watched her dad put on his shoes and go out the door with regularity all through the year in all kinds of weather. She watched me run races early on Thanksgiving, don rain gear to run in a heavy downpour, get up at the crack of dawn on a Saturday to run a race and even run in the rare instance where we get snow down here. During the Saturday run with my daughter, I kept coming back to something I had noticed these past 13 years. Whenever I got back to the house after each of my races my daughter would always ask me if I won. Of course the answer was always “no” because I’m a very slow runner but she never stopped asking that question. Silly me thought that she just shook her head and laughed at me while I participated in these seemingly meaningless races (that I NEVER won) but maybe, just maybe, she asked this question for another reason. Maybe she noticed how much joy I got out of running even though I never won any races. Running might not be about the awards but more about the simple act of just running. She had to have noticed and now she’s joined the club! What a great thing to share with your children. I can no longer run because of the abuse of many years of long distance running, if I run more than five miles now my joints absolutely shut down. But, my son (11 years old) is now playing competitive football and we do some very light weight training together. It’s really cool to spend time with him in this manner. Enjoy and blessings to you both.